Dynamo watches as Dusk jumped out of Broken's arms and rushes over to the kitchen table. He couldn't help, but chuckle as the young colt sat in his chair and waited patiently. "Seems like someone is ready to eat some dinner." He says as he felt Broken gently grabbed his hand. He smiles softly and laces their fingers together. "That must have been a dream come true. It must be amazing to play music together with someone that you idolize. I've heard rumors that Princess Luna was a gamer, but it's only just that. Simple rumors and nothing more. However, I don't think they're rumors." He says as he continued to listen to Broken speak about Vinyl Scratch. "It's that kind criticism that helps one to improve in what they love. I do have something to ask. I've heard some ponies say that she doesn't talk that much. Is that true? I didn't want to assume anything, or something like that." He says as he walks over to take his seat next to Broken. Night grins and nods in agreement to Night's claim. "I can see Broken giving Dynamo a goodnight kiss, but I don't want to push my luck." He chuckles as he sees Night sitting next to him. "I don't think it'd hurt to ask you that question, Night. Is the Princess of the Night a gamer? I've heard those rumors myself, but I didn't wan to assume anything." He then begins to serve himself his plate of food and begins to eat his dinner. "This is really good. I thought I would have gotten the recipe wrong, but I'm glad I was given some help. Thanks again for the help, Broken." He says as he takes another bite of his dinner. Broken smiles a little "Yeah it is true, except for her music and when she is DJing, she doesn't talk a whole lot. She's more of a 'actions speak louder than words' kind of girl" she says with a smile, and grips his hand a little tighter as they sit down. "Which i kind of admire about her. There is often too much talk, but not enough action, but with her, it's different" she smiles at him and nuzzles him "She also adores Dusk"
Night just laughs "You don't know the half of it" she says and nods "Yeah, gaming is like a guilty pleasure of hers, much like gorging herself on pastries and cakes is Tia's guilty pleasure" she says and laughs some more "It is also how she winds down from work, but just so you know, she's not so regal when she video games as she is otherwise"
Dynamo smiles with a nod as he listened to Broken talk about her idol. "That sounds like an interesting ideology, or something along those lines. Sometimes putting things into words doesn't really work out. It's better to convey your feelings and what you want to say into action. I think that's a great way to live by." He chuckles a little at Broken's remark. "I think I know what you mean. When it comes to Pinkie Pie, she's all about both talk and action. Sometimes I wonder how she defies the laws of physics, but then I don't try and question it." He says as he returns the nuzzle. "Sounds like Dusk is really popular with other ponies. I guess his kindness is very infectious with others." Button's jaw nearly hit the ground as he listened to Night's remark on Luna and video games. "I didn't think the rumors were true, but it turns out they are!" He cheers as he thought he was going to fly right out of his seat. "I didn't think the Princess of the Night would actually play video games. I could imagine that not many ponies would know about this. It makes you wonder how she is able to get around other ponies when it comes to playing online." He says, before adopting a somewhat serious look. "Nobody must know about Luna playing video games. If that were to happen, then all the gamer's in Equestria would be challenging her nonstop. Plus, it would take away from her duty as a Princess." He says as he thought of the Princesses well being and reputation. He then looks to Night with a hopeful grin. "So, what do you think? Has Luna been looking for a student to learn the way of the gamer? If so, then do you think Dynamo would be the student that Luna is looking for?" He asked her quietly as he didn't want the other's to listen to the conversation. Broken smiles "Oh he's a hit with the other mares" she giggles "He'll be a real heart throb when he is older" she says, gently patting Dusk on the head "Of course, by that time, he'll have a over protective father in you" she laughs and kisses Dynamo on the cheek "I can just imagine you challenging whichever filly he dates to a game off to test their mettle" she says and shakes her head "But yeah, he's just so sweet and I wouldn't take back having him." Night smiles as she listens to Button speak but also to the conversation that Broken and Dynamo were having. She nods "You are right there, only a select few know of her gamin habits" she says, eating some more of her pasta and smiling, "As for if she is looking for a protege? Well who knows, but if she is, I couldn't think of a better candidate than our own Dynamo" she says as her phone rings, "Speak of the mare" she says, answering it "Mhm, oh? Well glad to know, anyway we were just talking about you..yes, yes, oh you were thinking too? Well great, when? Tomorrow evening? I can ask" she says, covers the microphone of her phone and smiles "Dynamo, how would you like to meet Luna tomorrow evening?" she asks, waiting for an answer. Dynamo chuckled with a grin. "I guess he'll be a kind and caring ladies man in the future. I can imagine all the ladies will be after him. However, he's still young and might not understand, but he'll understand when he's older." He blushed slightly as he felt Broken kissed his cheek. "I can imagine that. I'd always be there to make sure that Dusk is safe and taken care of. Like a good dad should." He laughed at Broken's idea, but shook his head. "I would probably do that, but that does sound a tad extreme. It all depends on if they love Dusk for him and not for what he is or for what he has. They have to get the green light from us if they are to be in a relationship with him." He nodded in confirmation as he took another bite of his dinner. Button raised his eyebrows at the sudden realization. "I can imagine her sister would know of Luna's gaming habits, but who else? It's more of a surprise to hear that she's actually a gamer." He whispers, so that the other's couldn't hear his conversation with Night. "You can't forget me. I'm not that bad of a gamer myself, you know?" He spoke, while pretending to be hurt by Night's words. He stuck his tongue out playfully and chuckled. "I'm just kidding. If anything, Dynamo should be the one. I've seen him set records without trying. That, or he just plays for fun. It's always been his dream of becoming a professional gamer. Maybe being a student to Luna would be a great opportunity." He stopped as he heard Night's phone going off. His jaw dropped as he heard the news from Night's conversation with Luna. "Talk about opportunity is knocking on the door." Dynamo turned his attention to Night, who was asking if he would like to meet Princess Luna. "Tomorrow? Hmm...I'm not sure to be honest. I mean, don't get me wrong. It's always an honor to meet the Princess of the Night. However, I have a date with Broken tomorrow night, so I don't want to be rude and all that. Is there a reason as to why Princess Luna wants to see me?" He asks, while seeing the smug look on Button's face. "Should you tell him, or should I? Even better is if we should keep it a secret." He grinned mischievously as he leaned back in his seat. Dynamo raised an eyebrow in confusion and looked to Broken and Dusk, before turning back to the other couple in front of them. "Is there something I'm missing here?" Broken Record nods with a smile "Of course, I mean, I didn't expect to fall in love with one who I considered to be my gaming rival, but then, here you are. You helped save me from having to deal with the stallion who killed my second husband and Dusk's father, and then you showed me a good time with the co-op games." she smiles softly and warmly at him "You also show you care for Dusk, and that is a big thing for me, for if someone is to be with me, they must also love and care for my son" she nuzzles him lovingly, her tail lightly twirling itself around his. Night smiles as she kisses his cheek "Well, you see Dynamo, it is a surprise, but it is very important that you meet with her..hmm" she then thinks for a moment "I think I can arrange something though, so do not worry yourself over it" she says and smiles as she sees Dusk go for second helpings of the food, "He's going to grow up to be very strong, but with a kind heart" she says with a warm smile. Dynamo looked to Broken with a smile and chuckles. "I know what you mean. It sounds like one of those romance stories you would see in anime, or something like that. I never would have thought that I'd fall in love with someone, who I see as a rival." He noticed the warm smile directed at him, which caused him to return that same, warm smile. "I would have done what anyone else would have done. You're sweet, kind, funny, you've got style in music and games. I like you for you and I promise that I would always keep you and Dusk safe, Broken." He returns the nuzzle as his their tails intertwined. "I can promise that I will always care for both you and your son. After today, I can tell that you are both really precious to me." Button smiles as he felt Night had kissed his cheek. "You'll understand when tomorrow happens. Trust me, Dynamo. You'll want to meet the Princess of the Night. That's not only a once in a lifetime opportunity, but it's very crucial." He listened intently as Night came up with an idea for Dynamo and Luna to meet. He nods as he places his hand onto her own hand. "I'll help you out, so we'll make the meeting happen. I've got your back just like you've got my back, honey." He says as he kissed Night's cheek. He smiles and nods in agreement as Dusk went for a second helping of his dinner. "He'll definitely become a wonderful adult in the future. For now, he should enjoy his youth and discover who or what he's truly meant to be." Dynamo raised an eyebrow at what Night was talking about, but he chose not to worry about it. "Okay and I guess that sounds like a plan. I wonder what the Princess of the Night would want to talk with me. Do you have any ideas, sweetheart?" He asks as he looks to Broken with a confused expression. He looks to Dusk and smiles. "Looks like someone's hungry tonight. Do you like your dinner, little buddy?" Dusk looks to him and nods "It's my favorite" he says, piling the food up on his plate "And my mom always makes sure I get enough food" he then sits back down and begins to eat his seconds. Broken smiles "You are right, it is almost a manga worthy romance with us" she says and kisses his cheek once more, looking to Dusk "That's right, got to make sure you are well fed and happy, Dusky" she says to him and looks to her mother who was discussing things with Button "I wonder what they are planning, Dynamo" she says in thought. Night smiles as she texts Luna and nuzzles Button some more "I just messaged her, see if she can do a surprise drop by tonight" she whispers to him "Maybe during her rounds" she then finishes her food and leans back a little, noticing that Broken had also gone to get seconds. Dynamo smiles and nods at Dusk. "I know what you mean by that, Dusk. My favorite food is either chili or grilled chicken." He chuckles slightly as Dusk kept piling the food on his plate. "Just be careful not to take too much, son. You wouldn't want to give yourself a stomachache." He says, while making sure to think about his well being. He turns his attention over to Broken and nods at her remark. "That's good to hear. I'd worry if something happen to you, Broken. It's nice to hear that your mother looks after you and Dusk. It really shows how great of a mom she is. It's just like how my mom looked after me, before I moved to Ponyville." He says as he felt her kiss his cheek. "I can see that happening. Now if only there would be someone to write the manga of our blossoming romance." He chuckled and shook his head. "I think Fluttershy would read and/or make that story. I think I remember hearing that she's into anime, but I can't confirm if that theory is rumor." He took the last bite of his food, while humming in thought. 'So, it appears that Broken is in the unknown like I am, huh?' He finishes his food and put his utensils back on the plate. "I guess we'll find out when the time is right. I'm just glad to be spending time with you and Dusk tonight, Broken." Button smiles softly as he returned the nuzzles. He wrapped an arm around her and held her close. "I think that's a perfect idea." He whispers back to her as she explained the possible plan. "This way, Dynamo and Broken can go on their date interrupted. I'd hate for them to not be able to go on their date and to confirm their relationship. They look like a nice couple to me." He whispers as he finishes the rest of his food. "I guess we'll have to stick close to the window to make sure that Luna is on the way?" He asks, before kissing Night's nose. Dusk smiles and nods "I'll be careful Dynamo" he says as he then goes to sit down and eat his seconds. Broken smiles and continues to eat a little more. She looks to him "You know, that wouldn't surprise me, but of course things between us will have to become common knowledge first for a story to be told about us" she giggles and chuckles "I can imagine a manga though, and the cliche set up for us meeting" she giggles and nuzzles him. Night nods "Indeed, plus Dusk absolutely adores his auntie Luna" she says as she looks at the young colt "We will, she will be here soon how-ever, so just in time to see Dusk before bed as well"
Dynamo smiles and playfully ruffles Dusk's mane. "Thank you son and I'm sorry if I sound protective. I just want to look out for you, little buddy." He looks over to Broken and nods in agreement. "That's true when you put it that way. We'll still need to learn everything there is to know about one another. We just met, but I can wait on the manga being made. All that matters is getting to know you and Dusk." He couldn't help, but laugh with a smile. "I can imagine the manga would have every type of cliche there is. Plus, our meeting would probably be very sweet and caring." He says and returns the nuzzle. Button raises an eyebrow in slight surprise as he looks over to Dusk. "I didn't know that Luna was Dusk's nephew." He was quiet for a moment, before nodding at the idea. "Although, that does make a lot of sense. I mean, you are one of Luna's personal guards. In theory, that does make Luna a part of the family. Plus, it seems everyone loves Dusk and Luna being his aunt sounds nice." He looks to Night, before smiling softly with a slight chuckle. "Oh, trust me. If Dusk is asleep before Luna arrives, then he'll see her in his dreams." He whispers softly to Night, while giving her a wink. Dusk looks up at Dynamo and smiles "I know Dynamo, its okay. mummy is the same, even though she sometimes overeats, herself" he says with a cute giggle before digging into his food. Broken smiles and nods "He's not wrong there, there are times where I do over eat, especially sugary treats and ice cream" she says with a chuckle, hugging Dusk close to her. She then thinks about what Dynamo said about the manga "You are right, and we have all night today and all night tomorrow to start getting to know each other" she says and kisses Dynamo's nose "As for the manga, I am sure whoever does write it, will want our input, so it can be close enough to what happened, but still be a little over the top, just as many mangas are." she says and hugs Dynamo. "Well..you're half right there" Night says to Button, "She isn't really his aunt, but as I and his father worked closely with her, she does consider us as family, and well you know how she is with the young ones, especially the misunderstood ones who often at times feel alone" she states with a soft sigh, and smiles "And you are right, he will see her in his dreams, but it is always better to meet the pony in person, you know?" she asks, quickly glancing out of the window. Dynamo smiles as he ruffles Dusk's mane momentarily, before he went back to eating his dinner. He looks to Broken and gives her a knowing look with a smirk. "Sounds like we're all the same way. I get like that when it comes to eating chocolate and/or ice cream. Those treats are so good, but I try not to have too much chocolate. If that happens, then I get really sick. I'm not allergic to them, but chocolate can really give me a stomachache. I can never seem to learn my lesson. I try to limit myself on what I eat, but those desert treats are so good." He chuckled as he looked to both Broken and Dusk. "I guess I can understand how you both feel, kiddo." He wrinkles his nose slightly from the kiss, but he soon smiles and kisses Broken's forehead. "I look forward to getting to know you more, sweetheart. I have a really good feeling about us. I can tell you, Dusk and I will make a really great family." He chuckles in agreement as he returns the hug. "Manga and even anime seem to go over the top, but the love and romance they convey is the truth." Button chuckles and smiles softly. "Oh, I know, but it would be something to see if one of the ruler's to Equestria is his aunt." He says with a nod, before continuing. "I guess Princess Luna and Princess Celestia treat their guards like they are friends and family. It really shows that bond and unity within the royal family." He nods in agreement with Night's remark, while glancing out the window. "You're right about that. It's always great to meet someone you admire in person, instead of the dream world. It makes the experience all the more real." He squints his eyes as he thought he saw a figure outside. "Hey, Night? Is that Luna right outside?" He whispers, so as not to draw any attention from Dynamo and the others. Broken smile and hugs him tightly "You speak the truth there. Do you remember the romance between Yugi and Tea in Yugioh?" she asks with a giggle "Or even say...Android 18 and Krillin in DragonBallZ?" she giggles again and shakes her head "Over the top theatrics but the love is true, honestly sounds exactly like us" she says, kissing his cheek, then looks to Dusk "Dusky, sweetie. Tomorrow night, mommy and Dynamo have a date, so I want you to be on your best behavior for nana and mr Button, okay?" she asks, and he nods "Yes mama"
Night smiles as she then looks out the window and nods "Sure is" she whispers and goes to the door, opening it "Your highness, right this way" she motions for her to follow. She then smiles "Dynamo, there's someone special here to see you"
Dynamo chuckles with a smile as he returns the tight hug. "I would lean more towards the relationship with Yusei and Akiza. I mean, I like Yugi and Tea together, but there wasn't that much romance. Krillin and Android 18 I can agree with. Especially how they portrayed the romance done by Team Four Star. Now that was funny, yet really sweet." He says with a nod. "I can agree that some romances in anime are over the top, but the romance is cute and true. Although, that does bring up a good question. What kind of romance anime have you seen and/or like? Judging by the anime that you're listing off, you are also a fan of anime." He blushes as he felt Broken had kissed his cheek. He smiles and looks to Dusk. "Everything will be okay, Dusk. I promise to keep your mother safe from anyone on our date tomorrow. It'll also help you spend time and get to know uncle Button." Button held back a laugh as he knew someone was going to freak out, but decided to keep a calm composure. He was also looking forward to seeing the Princess of the Night. Especially learning that she was also a gamer. As the door opened to reveal Princess Luna, Button made his way over to the door and smiles with a bow. "Good evening, Princess Luna. It's truly an honor to meet you." He says as Luna had entered the home. Dynamo's ears perked as Night had addressed him. He looked to Broken and Dusk and nods. "I'll be right back." He says, before getting out of his seat and exits the kitchen. He entered the living room as he wondered why he was being called. "Is everything okay, Night? Who wants to see me this late in the evening?" He asks, but his question was answered as he saw Princess Luna standing before him. "Princess Luna!? W-What are you doing here? Don't get me wrong. It's nice to meet one of the royal princess, but I'm just a little confused." He says as he bows before the Princess of the Night. Luna smiles "Good evening Dynamo Pad, I understand you are a rather decent gamer...one of the best actually, and with quite the unique powers as well" she says, her smile not wavering from her face one bit "I would like to offer you to be my gaming protege" she says, still smiling, "But it isn't just your gaming prowess that caught my attention and impressed me, but your devotion towards not only Broken Record, but her son as well" she says. Broken nods "If I may interject, Princess." she says softly, holding Dynamo's hand gently "I never thought i would ever find a stallion who would love not just me, but Dusk as well. I also never thought it would be the one pony I thought to be my gaming rival" she squeezes Dynamo's hand gently "But I did, in Dynamo here, and I think you've made a wonderful choice to give him the chance to be your protege"
Luna continues to smile "Oh I know that Broken dear, your mother told me all about it during de-briefing" she says, then looks to Dynamo "So young one, will you accept?" Dynamo stood up from his bow as he listened to what Luna had to say to him. His jaw dropped from the news of being chosen to be Luna's protege. He was honestly stunned silent. He shook his head and finally found his voice. "I-I just don't understand. I mean, don't get me wrong. I'm flattered that I'm chosen to be your apprentice. It's just...why me? I don't really feel as though I have that much talent. I'm still learning to control and find my magic." He remembered his mother had taught him the basics after gaining his cutie mark, but that was about it. He didn't even know what other kinds of spells and unique magic he could wield. "Isn't there anyone else that's better at games than I am?" He asked in wonder to the Princess. He was being humble as he knew he was decent, but probably not at the level that she claimed. "Not only that, but I didn't know you were a gamer, Princess Luna. I've heard rumors and stories, but I didn't know it was true." Button grinned sheepishly and waves his hand to the blue unicorn. "Yeah, about that. I just found out a little while ago from Night." Dynamo turned to Button to give him a deadpanned expression. "You could have told me this sooner!?" Button chuckled and gave him an apologetic look. "I wanted to, but it seemed you were busy spending some quality time with your special someone." He winked as Dynamo pouted at Button, before chuckling. "Fair enough, but this is surprising." As Luna explained the other reason of why she chose him, Dynamo felt Broken's hand in his. He looked to her as she explained how she felt about him. He smiled and squeezes her hand gently. "I was never the best with relationships, but I guess it's because I try to find the best in others. When that happened, a lot of ponies tried to take advantage of me. I would only be in a relationship with someone who related to me on one thing or another and one, who loved me for me. When I saw Broken, she seemed like a great rival, but I saw her as both a mare and a gamer. I even care for her son and he's a sweet and kind child. I know he'll be a great and amazing pony in the future under the right guidance of his mother and father." He winked to Broken to emphasize what he meant in that statement. "I couldn't honestly think of anyone in my life except for them and those that mean a lot to me." He says as he turns his attention to Luna. "To answer your question, Princess. I accept your offer to be your gaming apprentice, but I still would like to know. From all the things I said earlier. Why would I be the one chosen to be your apprentice?" Luna smiles "I am well aware that there are better games out there than you, and stars know, even Broken Record here, but not man of them have the strength of heart and courage that you do." she says, smiling at him warmly. "As for me being a gamer, only a select few know about it" she says as Night interjects "and out of respect for her, we swore an oath of silence, swearing that we would only tell those we implicitly trust." Luna nods "As I was saying, I can sens something special about you. Ever since that convention you attended, I had been keeping my eye on you" she says, kneeling to be at a bit more of an eye level with him "It isn't every day, that someone can show such courage" she smiles and then looks out of the window "A rivalry can be something good, but it can also be something bad. As I should know" she then looks back at him, "In truth...I am hoping that maybe you can teach me something about turning a rivalry, more specifically, my rivalry with my sister" she says, still looking at him "turning my rivalry with her into a deep friendship" she finishes. Broken smiles and squeezes Dynamo's hand once more "I think you couldn't have chosen a better pony, Luna" she says, "Before I actually met Dynamo today, all I wanted to do was break his records, and while I was somewhat angry every time he would break my own records, I was determined to beat his records over and over again, and to a point, I spent long nights trying to do so, often losing sleep. I shut everyone out of my life due to it." she says then looks to Dynamo "but then this morning, when I finally met him in person and he..protected me from the stallion who..who murdered my first husband. I saw him in a different light, and that light begun to glow brighter and brighter over the day, as I saw how humble he actually is about his records, and most importantly, how he almost instantly took my Dusky under his wing, so to speak, and to act as a good role model for him." Luna smiles "Of course little one, Dynamo is a very important pony, even if he can't quite see it yet" she says then looks to them "Now, I understand you two have a date tomorrow night, hence why I chose to come here tonight instead of tomorrow. How-ever, from the night after, you will be picked up every night and come to the castle to learn from me" she says to Dynamo "understood?" Dynamo was in awe of what Luna was telling him. He looked over to Night, who was explaining that Luna being a gamer was a secret. He nodded almost immediately and gave Luna a serious look. "You have my word that I won't say a thing to anybody. There's not a lot of people that I talk to, to be honest. Regardless, they'd think I'd be talking about an old mare's tale." He smiled softly at the mentioning of the tournament he went to a few months back. In truth, this wasn't his first time seeing the Princess of the Night. However, this was his actual first time meeting her in person. "Thank you for helping me on that day. I don't know what I would have done without your guidance." He bowed humbly to show his thanks and appreciation. He looked up and nods at her explanation. He knew how some rivalries could end up good, or could go badly without warning. "I've had my share of bad rivalries. Even if the one you face is rude or disrespectful. You still can't help, but respect how well they play in a game. If I am able to help, then I will help show the right way to have a good rivalry. A rivalry should always end in friendship and respect, in my opinion." Button nodded in agreement to some of Broken's remark. "It's true. I would see her in certain days of the week. Always on the same arcade machine and wanting to beat the high score. Sometimes she would make a small mistake and then start over with new determination." Dynamo's ears fell as he felt bad for making Broken feel that way. "I'm sorry that happened to you, Broken. I wasn't trying to make you lose sleep or friends. I just play and try to have fun. I always want to try and push myself to new heights when I play. I never really saw it as breaking records." As she continued to explain today's events, Dynamo smiled fondly to the gray mare next to him. "I can say the same thing. At first, I thought you were someone who wanted to break a record to prove a point. However, when we played that new game together, I could tell that you loved gaming. You had a passion for something that you truly care about. I can say the same to Dusk. He has what it takes to be a gamer one day. Regardless if his cutie mark is gaming related or not. He has the heart and determination for the games he loves to play." He says as he looks to Broken and squeezes her hand once more. "You two have become really important and precious to me. I really do like you Broken, as well as Dusk. In a way, I can see him as a son to me." Dynamo chuckled at Luna's remark. "I guess it's just because I've been told that I'm not special." He frowns softly, while looking towards the ground. "Back when I was younger, a lot of ponies had ganged up with my bullies. They all said that I'd never become anything special. That I'm not destined for greatness." He sighs, before continuing. "Even when I tried to do something special, others just looked the other way, or told me that they'd never take me seriously. A few ponies at the arcade back home took me seriously, but I was afraid to trust them. We are still good friends, but I still couldn't help, but worry." He looked back up with a determined smile. "Over time, I've been trying to change and believe in myself some more. I don't want to feel negative about anything. I want to prove that I can do my best and become somebody that others can be proud of." Button flashed his friend a smile and gave him a thumbs up. "You'll do great, buddy. When I met you, I thought it was cool that you knew Mr. Pinball. He told me that you were something special when he met you. Ever since we worked together, I've been seeing what Mr. Pinball was talking about. You'll be great as her apprentice." Dynamo smiled as the two fist bumped each other. "Thanks, Button. That really means a lot." He says, before nodding at Luna's training schedule. "That's completely fine by me and understandable. Thank you for allowing me to go on my date with Broken. That does bring up a good question though." He says, before raising an eyebrow to Luna. "What will you be teaching me in? Am I to learn a new type of magic or something along those lines?" Broken hugs him close "Oh sweetheart, it's not your fault all that happened. My strength and resolve in my determination and my own faults is what caused that to happen" she reassures him, nodding at what Dynamo was saying "I know how you feel, but it's with my music, not my gaming. I often believe that people want to be my friend or just see me as the DJ and not the mare behind the music" she says and closes her eyes "Then there are the people who always say that my music always sounds the same and that there is nothing special about it" she then shakes her head and looks to the others before looking to Dynamo "How-ever, I am glad that we were rivals, because if I wasn't your rival, I may have never met you" she says and nuzzles him lovingly "and now I feel special to have someone like you, nay, you, in my life, and in my son's life as well" she says and smiles. She may have lost both her previous husbands, but she felt safe and happy with Dynamo. Dusk looks up to Dynamo then to Luna "Auntie Luna, Dynamo really is special, to both mommy and me" he then heard the sadness in Dynamo's voice, going over to him and giving him the biggest hug that he could give him "Dynamo? Don't be sad, please?" he asks as he hugs him some more "You are special, very special, to me and my mommy" he hugs him even more, nearly tearing up out of sadness that the stallion he was already beginning to see as his father, was feeling sad. Luna smiles and nods "Out of the mouths of foals" she says and then looks to Dynamo "You are a special stallion, dear Dynamo." 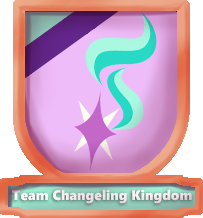 she says "Not every pony can see a visage of loved on who has passed on during something like a tournament" she says and bows "I will be teaching you various things, ranging from different types of magic, gaming styles and well team play. You will also aid me in my dream walking and helping others in their dreams. You'd be surprised how many can be gaming related"
Dynamo nodded at her reassurance as he returned the hug. "I'm just glad that everything turned out okay and that everything worked out. It's always good to have a rival because you know you'll meet them again. That, or you might meet them for the first time and feel that special connection." He nods at her remark as he could see how they could relate to each other. "Those are just critics, who don't know good music when they've seen it. I may not have heard a lot of music in my time, but I could listen to your songs and think they are awesome. It's always good to change things up, whenever you have a sudden spark of inspiration." He says as he returns the nuzzle. "I'm really glad that you and I are, or were rivals. No matter what, I'll always see you as my special someone and my rival. I'm glad that I'm a part of your's and Dusk's life, as well as having both of you in my life." He was caught off guard as Dusk went up to him and hugged him tight. He looked down and picked Dusk up as he hugged the blue unicorn some more. He felt bad that he was making the young colt cry, but he smiled softly at Dusk's kind words. "Oh, son. Please don't cry." He hugged the young colt close to him as he placed a hand behind his head. "I feel really special to have you and your mother in my life. Especially having Button, Night, Princess Luna and others that I've met. I've gone through a lot over the years, but knowing you're all here just shows how special I am. I feel rather lucky to be here right now. I wouldn't have it any other way." He pulled back from the hug to wipe Dusk's tears away with his thumb. "Now no more tears, okay? Where's that great smile that I like to see?" He ticked Dusk, until he was able to see a smile. Dynamo looks to Luna and gave her a grateful smile. He held out a hoof and waves said hoof to the Princess of the Night. "Thank you and please. You don't have to bow to me, Princess Luna. I see you as both my teacher and my friend, so there's no need to bow." He says as she explains what he would learn in her training. "I'm beginning to wonder what kind of magic I'll be learning. I know the standard light spell and levitation spell, but that's about it. My mother taught me the basics, but I could never get down the shield or laser spells." He says, while listing off everything he could do. Dynamo was surprised slightly that he would assist Luna in her dream walking abilities. "I've never had to dream walk before, but it sounds like a lot of fun. I'll help others out in any way that I can. I could even imagine that some dreams would have gaming levels in them." Button nods in agreement, before chuckling slightly. "I bet Princess Luna anticipated this and tried to see who could master that game." Dusk looked up at Dynamo with the tears in his eyes, but let a small smile appear across his face as he felt the loving embrace that Dynamo was giving him. his smile grew a little bit more when he heard Dynamo call him son, and then he couldn't help but giggle and laugh as Dynamo, the stallion who he now saw as a father, was tickling him. He dried his tears and smiles at him, nuzzling him "Alright daddy" he says, nuzzling him some more. Broken smiles and nods "It's okay Dusky, yes your new daddy was crying, but I bet some of those were happy tears" she says, giving him a gentle pat on the head and ruffling up his mane, before looking to Dynamo and smiling "We all feel the same about you Dynamo, and you're right. They're just dissenters who don't know good music when it hits them. They say Vinyl and Neon's music are better, but who do you think mentored me?" she asks with a chuckle. Night smiles "I bet, and of course it would be our Dynamo that mastered the game" she says and smiles over at Dynamo. Luna smiles as she turns to leave "You are right there, and do forgive me Dusk, but those mean foals at the arcade earlier? Set ups by me, I wanted to see how Dynamo would react to you being bullied. He passed with flying colors" she says and then smiles as the small colt hugs her. "I forgive you auntie, it meant I got to play games with my new daddy, so it's all good"
Luna smiles and nuzzles him "I am glad you saw it that way small one, I shall see you soon enough" she hugs him then leaves. Dynamo grinned as he saw that Dusk was smiling once again. "There we go! That's the smile I like to see." He chuckles, before smiling softly and hugging his son tightly, but not too tightly. It was a way of saying that he would always be there to protect his son. The blue unicorn looks to Broken with a smile as Dusk continued to nuzzle him. "I'm glad you feel the same way, Broken. I can assure you that we all feel the same way about you." He says, before chuckling at her remark. "I see both VInyl and Neon were great teachers, as well. They helped their friend rise to greatness, but it's like you and I said. Nobody would know great music or anything if they were slapped in the back of the head. I'm glad you don't let it get to you. Focus on your happiness and what you truly love in your heart." Button looked to Luna as she and Night were right about his hypothesis. He promptly fainted as he was shocked by this sudden realization. Dynamo looked to Luna with an equally shocked look upon his face. "Wait a minute. You mean that the new game was to see, who was worthy to become both an apprentice and a successor?" He was silent for a few moments, before shaking his head with a smile. "That's just plain genius. I guess since the game was fairly new. It makes only sense to see who could figure the game out first." Button sat up, before nodding in agreement. "I guess it was more than a coincidence to get that game in the arcade. I wonder if there were other places, who got that game, as well." He wondered, but decided against it. Dynamo was slightly surprised by Luna's plan, but he couldn't be mad at his new teacher. "I guess it was a way to see how I would take care of Dusk. I'm just glad I was able to be there for my boy." He says as Luna took her leave for the evening. "Good night, Princess Luna. I'll see you soon for our video game training." He bows, before standing up and waving to his new teacher. Luna smiles as she turns around and smiles "Yes, and I am glad to see that my faith and trust in you was not misplaced" she says and then look to Button "I wanted it to be a surprise, I felt that if you knew, you would instantly put your best to to the test, whereas if people could choose to play it on their own, I could see their true mettle" she says before looking to Broken and Dynamo "And I am glad, seeing how well you two work off of each other, worked out perfectly, it confirmed my feelings in you being the best candidate" she walks out of the door and spreads her wings "Until the evening after tomorrow" she smiles and flies off. Dynamo smiles and nods at Luna's remark. "I'm just glad I was able to make a good first impression. Thank you for stopping by tonight, Princess Luna." He says as Button nodded in understanding. "That makes sense when you put it that way. That's also very clever and it makes sense. Given that you are a video game master." He says with a chuckle. As Luna went on to explain how Dynamo and Broken worked well with each other, the blue unicorn wrapped an arm around her shoulder and pulled her close. "Thank you and I'm glad that you approve. I couldn't as for a better mare to be my special someone." He smiled softly with a light blush dusting his cheeks. He nods as Luna began to fly off. "You've got it. I'll see you the evening after tomorrow." He says, before waving at the retreating form of Princess Luna. He sighs, before grinning slightly at the thought of being trained by the Princess of the Night. He would figure everything out later on what would happen next. For now, he wanted to enjoy the rest of the night with everyone. At the mention of desert, Button shot a hand up into the air. "Ooh, me! I want to have some desert!" He floated in the air, before dashing into the kitchen. Dynamo chuckled at Button's enthusiasm, before nodding at the offer. "Desert sounds really good. What's for desert?" He asks, before turning to both Broken and Dusk. "What do you think? You both ready to enjoy and relax for the rest of the night?" He asks as he started to make his way back into the kitchen.